If you want to learn Spanish by the sea, then Murcia is perfect for you, as it has two! The Mar Menor is, in reality, a large lagoon, but it is a spectacular location for water sports and is often warmer than Mediterranean, from which it is separated by La Manga, a 22km sandbar! Murcia is known as ‘Europe’s Orchard’, thanks to its bounteous supply of fruit and vegetables, from which the city’s chefs make some of the most delicious tapas in the country! A university city, Murcia perfectly balances its vibrant, youthful atmosphere with a rich history and culture, making it an excellent location in which to learn Spanish! Famed for hosting many colourful fiestas, Murcia is also a wonderful location for those interested in sports. Whether you enjoy golf, sailing, tennis, horse-riding, water sports or even adventure sports such as rafting, canoeing and hang-gliding, Murcia is the perfect location for you! Our school in Murcia is located in the heart of the city, very close to the university. Nearby attractions include the Cathedral and several museums, as well as some excellent bars and restaurants. Amongst the many fantastic facilities offered by our school in Murcia is a library complete with multimedia and audio-visual equipment, as well as wireless Internet access throughout the school. 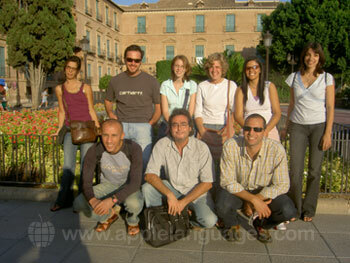 Our school in Murcia offers a wide range of Spanish courses to suit every need! You can choose from group courses of 20 or 25 lessons per week, private lessons, and combined courses of group and one-to-one tuition. Our school also offers ‘Legal Spanish’ and ‘Business Spanish’ and ‘Spanish for Tourism’ courses, as well as an ‘A-level Revision’ course, and a ‘DELE Exam Preparation’ course. Our school in Murcia offers host family accommodation, which is a fantastic option if you wish to make as much progress as possible during the time you have available! 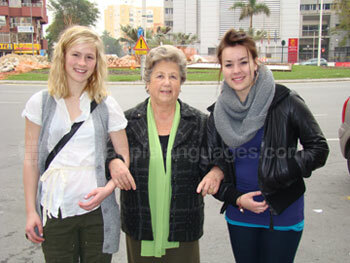 Your host family will encourage you to practice speaking Spanish with them as much as possible during your stay. All host families are very carefully selected, and are very experienced in hosting students of all levels, from complete beginner to advanced! You can choose between half board or full board accommodation: half-board accommodation includes breakfast and your evening meal, whilst full-board accommodation includes your lunch as well! Our school in Murcia offers a wide range of activities, such as guided tours of the city, welcome parties, intercambios with Spanish students, tapas tours, dance lessons, rafting, water-skiing, diving and sailing. These activities are not only designed to give you a chance to discover the local culture and the local area, but also give you more opportunity to practice speaking Spanish outside of the classroom! All activities are optional, and whilst some activities may be included in the course price, others may incur an additional charge payable directly to the school. Fly into Murcia, Madrid or Alicante Airports. Alicante Airport is likely to be the most convenient option, as flights into this airport tend to be more regular, and the transport links to Murcia do actually tend to be better than those from Murcia Airport. You can take a bus from Alicante Airport to Murcia. We can arrange an airport transfer for you from Alicante or Murcia Airports, although please note that this service is not included in the course price. Average score for our school in Murcia based on 4 previous client reviews. The language lesson was fun and definitely recommended, the activities was fun again. The accommodation where I stayed was perfect, near the les location and the reception was very welcoming! The teacher Francisco was exceptional. Explained grammar well, gave us time to ask questions, varied the activities and gauged our level well. Most conscientious. I think it is amazing that you organize all these activities. In this way the communication in Spanish improves, we get to know the Murcian culture and other people. I am impressed. Everything was perfectly organized and explained, the people who work there are all so kind, friendly and helpful. I tried to come up with something for you to improve but I couldn’t think about anything. I really like it! I am really satisfied with the Institute and I would recommend it to everyone! The institute is very good and everyone is most friendly and welcoming. Not mention the patience of the teachers. As a beginner of Spanish I found I had a lot to learn and understand, but I will continue to try! It has been a good experience so much that I continue most delight and cheerful and at times funny! The location is excellent. Prior to booking, the staff was helpful and efficient. Murcia is easy to get to from UK. Its historic, pleasant, clean and I felt safe here. The historic buildings are magnificent. Murcia is a lovely city. It felt safe, the people were friendly. The varieties of restaurant were good with reasonably prices. The institute is conveniently central and fit for purpose. Everyone is friendly and professional. Murcia is a very interesting city, very beautiful. The people are very friendly and the food is excellent. My objective was to improve my communication skills, primarily verbal in Spanish. My teacher’s humor and artistic skills makes his delivery very effective. Interaction with the teachers and other students helped to achieve that objective. Everything was good, my host family, my teachers and the activities. I would highly recommend this school to anyone wishing to learn Spanish in a professional and funny way. 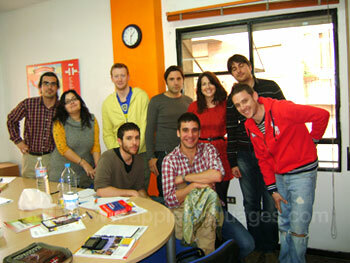 The way the tenses were tought were very good and communication classes were very relaxed and enjoyable. I loved my teacher and the location from my house. I really liked where I stayed, the lady was really nice and made very good food. My sister had been already here and she recommended Murcia to me, Good and fun! What I liked the most was the atmosphere. Everyone was friendly, the rooms were very nice and I loved learning all the Spanish phrases from my teacher Ana. The more I was here the longer I wanted to stay. I loved the culture class with Loli. Very serious web page, good price, good location. Loved reading about all the happy students. I wish I could stay longer. ¡Una buena experencia! Easy to participate in. Really enjoyable and good at getting us to speak Spanish. The activities available were very good. Staff very friendly, had everything needed. Now I have more confidence in speaking and have improved grammar. LEARNT A LOT AND HAD A BLAST! I am very happy with my experience in Murcia. I will return soon with my whole family. Lessons were very interesting but a bit difficult, but I have learned a lot. There is no need to take public transport in Murcia, the school is very well located, and next to many bars, restaurants and museums. I really enjoyed my host family, their kids and the food was gorgeous. The city tour was really good. I loved the relaxed informal classes and having discussions in Spanish. Also I wasn't required to write loads. The tram was very useful. Murcia is a nice city except for Sundays when everythings is closed...but it happens everywhere in Spain! Excelent and highly recommended. Awesome personal approach. Murcia is a nice town with a good community feel to it. It's a pleasent town. The central part of the city has many architecturally impressive buildings, everything seems close by and easy to walk to. 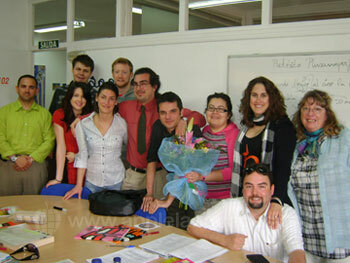 What I liked most about IH Murcia is the small classes and the individual correction of my pronounciation. My teachers were prepared fot the lessons, had good time management skills, were friendly and willing to help. The school is small and very well formed, which is very good for meeting other students. What I liked the most was the small number of students in every class and the different nationalities. The classes are small enough to feel confident and comfortable with the group, but big enough to learn from your classmates. I think Murcia is the best place in Spain to learn Spanish. The people are friendly, the city is beautiful, and the weather is perfect. I will definetively return to Murcia next year. The grammar concepts that we covered were tought very well! Discussions and debates were good practice to speak Spanish. I really enjoyed living with my host family. The family made my experience here in Murcia very enjoyable. EXCELLENT HOST FAMILY! Murcia – Traditionally Spanish and constantly sunny!